The next Pixelversity events are announced for April-May, engaging with Kuebiko programme of Artists in the Archipalego (Kimitoö/Kemiönsaari) and related sustainability issues. First up, is a seminar titled 'Kuebiko- linnunpelättimiä ja muita suojelijoita' (Scarecrows & other ways of care-taking) will take place on 9th April, that brings together rural cultural heritage, participatory actions & bio-ecosystem awareness with self-organised art practices. Kuebiko refers to the scarecrow and weather vane (suomeksi: linnunpelätin ja tuuliviiri) built last year by Artists in the Archipalego collective. 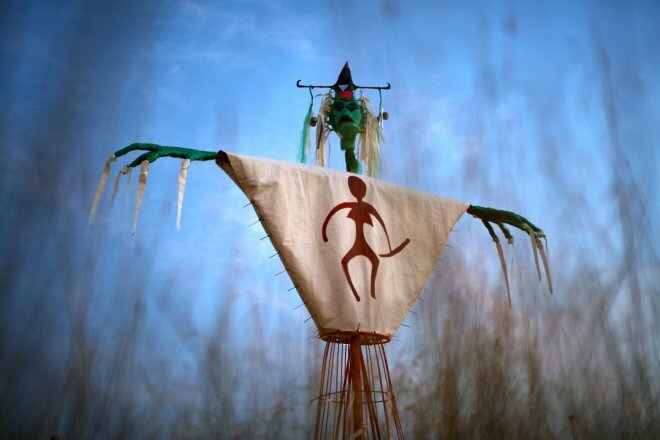 They borrowed its name from Japanese Shinto culture and it stands for a spirit of knowledge in the form of a scarecrow. "Because he stands all day outdoors, he knows everything". Being two-faced, he sees everywhere. Pixelversity makes an open call for a small group (up to 8 persons) from Helsinki to participate in a subsidised overnight trip to Kimitoön/Kemiönsaari to attend the seminar. Respond by Sunday 3rd April.